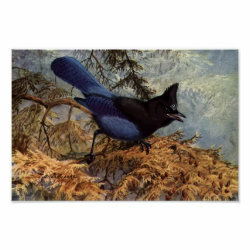 This bold and vibrant reproduced painting of a Steller's Jay is by famous Canadian bird artist and ornithologist Allan Brooks. 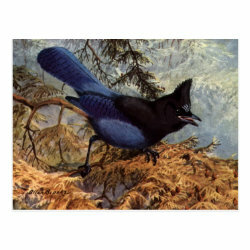 This classic bird art makes More... a great gift idea for anyone that loves these intelligent birds of the mountains! The jay is in a dynamic pose, leaning downwards with beak slightly agape.